Beliefs and expectancies influence our everyday thoughts, feelings, and actions. These attributes make a closer examination of beliefs and expectancies worthwhile in any context, but particularly so within the high-stakes arena of the legal system. 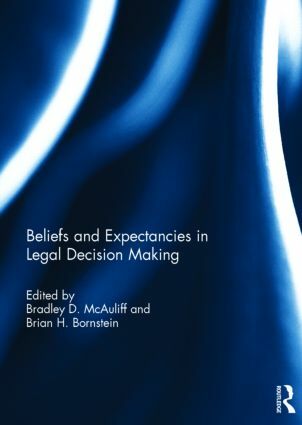 Whether the decision maker is a police officer assessing the truthfulness of an alibi, a juror evaluating the accuracy of an eyewitness identification, an attorney arguing a case involving a juvenile offender, or a judge deciding whether to terminate parental rights—these decisions matter and without doubt are influenced by beliefs and expectancies. This volume is comprised of research on beliefs and expectancies regarding alibis, children’s behaviour while testifying, eyewitness testimony, confessions, sexual assault victims, judges’ decisions in child protection cases, and attorneys’ beliefs about jurors’ perceptions of juvenile offender culpability. Areas for future research are identified, and readers are encouraged to discover new ways that beliefs and expectancies operate in the legal system. This book was originally published as a special issue of Psychology, Crime & Law. Bradley D. McAuliff, JD, PhD, is Professor of Psychology at California State University, Northridge, USA. He is Associate Editor of the journal Law & Human Behavior. Brian H. Bornstein, PhD, is Professor of Psychology and Courtesy Professor of Law at the University of Nebraska-Lincoln, USA. He is co-editor of the journal Psychology, Crime & Law.